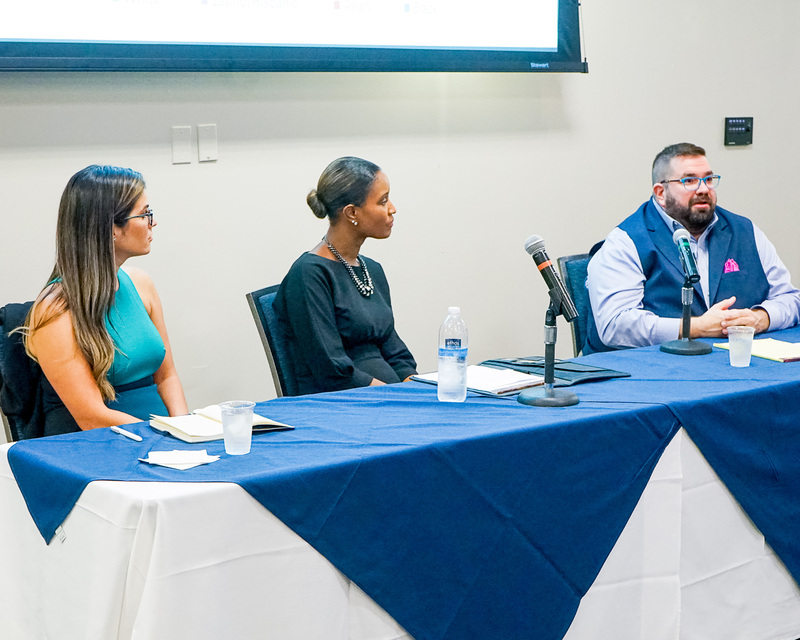 The Public Relations Society of America, Hampton Roads chapter, recently held the event “Embracing Inclusion in Public Relations” featuring three local experts who shared their experience and thoughts about the state of diversity and inclusion in the industry. The panel, moderated by Roddena Kirksey, co-chair of the chapter’s Diversity Committee, debated the importance for organizations to be inclusive to reach diverse audiences in an ever-changing world. The panel was composed of seasoned public relations professionals, including Kelli Webb, founder and CEO of The KBD Group, LLC; Vincent Rhodes, Ph.D., APR, chief communications & marketing officer at EVMS; and Jennifer Serrano, marketing communications manager at Vandeventer Black LLP. Panelists from PRSA Hampton Roads’ “Embracing Inclusion in Public Relations” tackles questions from aspiring PR professionals at ODU. From left to right: Jenniffer Serrano, marketing communications manager at Vandeventer Black and Diversity and Inclusion Committee member; Kelli Webb, founder, and CEO of The KBD Group, LLC; and Vincent Rhodes, Ph.D., APR, chief communications & marketing officer, EVMS. The panel was preceded by a speed networking session connecting aspiring practitioners from the Public Relations Student Society of America (PRSSA) chapter at Old Dominion University to professionals within the industry.